On February 4, GM announced that it would retrench nearly 4,000 employees in the US. 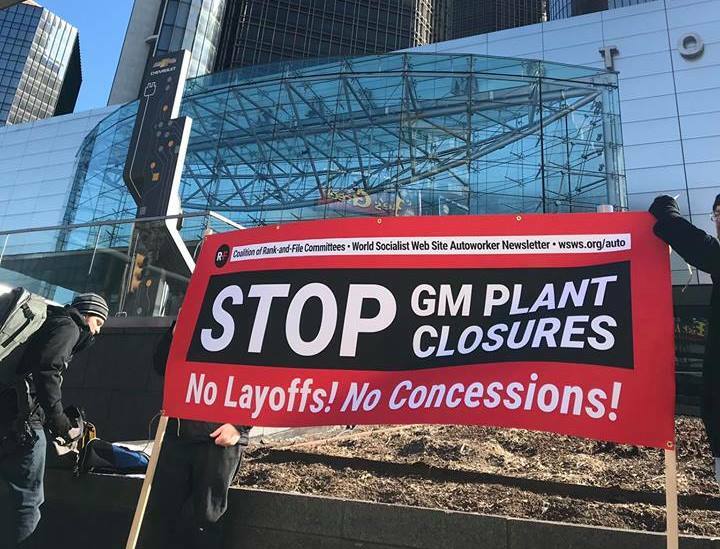 Hundreds of autoworkers marched in Detroit on February 9, protesting the announcements made by General Motors (GM) of the closure of their plants and massive layoffs. According to Detroit Free Press, on February 4, GM announced its plan to eliminate about 4,000 jobs across North America, including close to 1,300 jobs at the company’s Warren Technical Center. In November 2018, the company had announced the shutdown of its assembly plants in Detroit-Hamtramck in Michigan, Lordstown in Ohio and Oshawa in Ontario, putting 14,000 jobs at risk. The company’s decision has been criticized as a plan to maximize profits by increasing the workforce in low-wage countries, like Mexico, at the expense of its plants in North America. The United Auto Workers Union (UAW) said, “GM’s proposed plant closures and layoffs are expected to eliminate 14,000 jobs in Ohio, Michigan and Maryland, and will impact or eliminate tens of thousands of additional jobs within the automotive supply chain”. “GM is doing very well financially. In 2018, the company netted close to USD 12 billion in profits. GM is choosing to close plants and move production to Mexico, rather than update facilities in the United States, save jobs and keep production here at home. GM’s proposed layoffs and plant closures will save the company USD 6 billion — less than one quarter of the money that they’ve handed to wealthy shareholders in stock buybacks and dividends over the past 3 years,” UAW added. UAW president, Garry Jones, said in The Hill that GM benefited from taxpayers’ money on several instances since 2008. He pointed out that the US government had lent a helping hand, in the form of a bailout package through the Troubled Asset Relief Program (TARP), when the company announced that it had lost USD 38.7 billion in fiscal year 2007. It should be noted that such an announcement was made in the backdrop of Donald Trump’s chest thumping about signing a new trade agreement, United States-Mexico-Canada Agreement (USMCA) with Canada and Mexico, after annulling the North American Free Trade Agreement (NAFTA). While signing the USMCA on November 30, 2018, Trump had promised that the agreement would stop companies from closing U.S. factories. Since his presidential election campaign in 2016, Donald Trump has been assuring US workers that he would bring an end to plant closures in the country and persuade industries to manufacture from US itself. With this promise, Trump had especially sought to woo voters in the erstwhile-industrial belt, now dubbed the ‘rust belt’, including the States of Michigan, Ohio and Wisconsin. World Socialist Web Site reported that the rally, and the subsequent meeting at the Second Baptist Church of Detroit, on February 9, was followed by workers all over the world on social media. The protest received powerful statements of support from representatives of the Maruti Suzuki workers in India, who face framed cases, tea plantation workers in Sri Lanka and the striking auto-parts workers in Matamoros, Mexico. Greetings were also sent from workers in Turkey, Germany, the UK and Australia. Hey Buddy!, I found this information for you: "American autoworkers protest GM’s plant closures and retrenchments". Here is the website link: https://peoplesdispatch.org/2019/02/11/american-autoworkers-protest-gms-plant-closures-and-retrenchments/. Thank you.